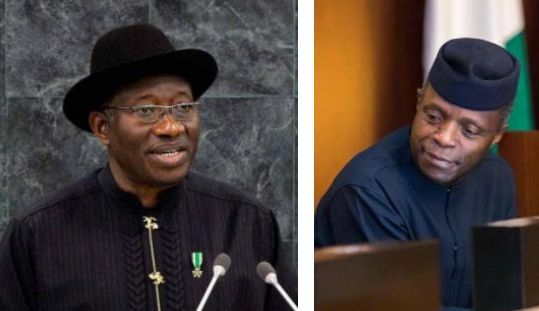 Goodluck Jonathan, on Tuesday, replied Vice-President Yemi Osinbajo, saying his administration was second to that of General Yakubu Gowon in building infrastructure in the country. Vice-President Osinbajo had, during his speech at the Abuja Legislative and Economic Summit on Monday, said Jonathan’s administration did not build any infrastructure for the country. “It is on record that the Jonathan administration is only second to the Yakubu Gowon administration in terms of infrastructure. “The most expensive and valuable project built in Nigeria in the last 20 years is the $1.8 billion Abuja-Kaduna 187-kilometre super-fast railway that enables Nigerians to work in Abuja and live in Kaduna. It further indicated that the former president revived the Nigerian Railways in 5 of the 6 geopolitical zones and also restored direct rail service from Lagos to Kano, Port Harcourt to Maiduguri and Makurdi to Gombe. “My question to the vice president is: who built these rail infrastructure that Amaechi was referring to? “Under former President Jonathan, Nigeria, for the first time, had national radar coverage through the the Total Radio Coverage of Nigeria (TRACON) project completed by the administration in 2012. TRACON is the reason Nigeria no longer has frequent air crashes. “Going further, the Jonathan administration completed the $600 million 750MW Olorunsogo II Power Station in Ifo Local Government Area of Ogun State. “The Jonathan government also built the 504MW simple cycle Gas Alaoji Power station in Aba, Abia State. That administration also built 12 new federal universities, including the only federal university in President Buhari’s state of Katsina. “The Jonathan administration also constructed and completed 165 Almajiri schools all over northern Nigeria. “These are just a few of the many projects that the Jonathan administration provided for Nigerians. “Now, I urge Nigerians to compare these projects with what has been conceived of, started and completed by the Buhari administration, which has only been able to initiate and complete only one project in two and a half years, which is the helipad in Daura. “How can an administration that cannot even provide paracetamol for the Aso Rock clinic, despite over N3 billion budgeted for it under President Buhari (according to the First Lady) accuse the Jonathan administration that refurbished 10 general hospitals for the masses across Nigeria? On whether the Jonathan administration inherited a foreign reserve of $45 billion, the statement debunked it, adding that the reserves under Jonathan hovered between $33 to $35 billion. It declared that what the vice-president added was the Excess Crude Account to make the reserve up to $45 billion. He also said members of the current administration were the same people who dragged the former government to court to force the it to share the funds in the Excess Crude Account. “There was never a time that the external reserve was $45 billion under Jonathan. The reserves were between $33 to $35 billion under Jonathan. The money the vice president added to make it $45 billion was the Excess Crude Account which Jonathan refused to touch until members of the All Progressives Congress, led by the then Governor of Rivers State and chairman of the Nigerian Governors’ Forum, Rotimi Amaechi, took the Federal Government to court and got the Supreme Court to force the Jonathan administration to share that money with them,” the statement said.